The front of the Durham Times seemed to have been thrown together too quickly on 17 July, with bland headline words and an overall lack of impact. … went the second line, only making sense once re-read, if anyone could be bothered to read that dull summary again. … as the second line, spelling out how the Chancellor’s austerity drive is hitting specific local services – and much better for search engine optimisation once online. The reason I’m being so pedantic is that I know this newspaper’s editor could, and ideally would, do so much better. But that editor is Peter Barron, and while he’s one of the industry’s best and most experienced, his attention is more than fully engaged on all the other titles he’s been charged to edit. Not only is Peter in the chair at the daily Northern Echo, but he also has to run the weekly Darlington and Stockton Times cat-killer as well as the Durham Times, along with various other weeklies and all their websites. Even if Peter, or one of his trusty lieutenants, had the time to write quality headlines for each and every weekly, I’m pretty sure that responsibility’s been taken away from them by Newsquest’s controversial switch of production to a subbing hub 270 miles away in South Wales. That’s certainly the impression the rest of the front page made: ‘BIG MEETING’ and ‘THE JOURNEY’ were the dull words used for the main boost headlines, their pictures either so tiny (the miners’ event) or so dark (the sculpture) that they were pretty useless. And the ‘News briefs’ down the left-hand column would have been fine as informative nibs for inside news or entertainments pages, but what on earth were forthcoming bike fun days, organ recitals, college dances and local hikes doing on page one? ‘Failure to walk lands captain with three disciplinary points’ leading the back page. These and many other stories were good reads, but it was frustrating to find missing details or unanswered questions because of the clumsy way pages had been put together. Take the Durham Miners’ Gala spread on pages two and three: among the pictures randomly used was a close-up of well-known artist Grayson Perry and a lead picture of Labour leadership candidate Andy Burnham, but neither were referred to in the story (or if they were, these mentions had been cut). I could go on, but the point’s made: this newspaper’s lacking the caring, detailed touches that traditional local subs can and once did bring, to the detriment of the reader’s experience. I hope Peter and his troops in Darlington and Durham know these production criticisms are not aimed at those who fill the Times and its above-mentioned sister titles with quality journalism. But I believe they’re being let down by the mediocrity of long-distance, central production hubs with a ‘that will do’ attitude, a lack of experience or a shortage of time to do better. Further inside the paper, I enjoyed discovering how veteran ex-editor Malcolm Warne is keeping fed and watered since he retired from the D&S Times, his ‘Filling but not too thrilling BBQ’ restaurant review appearing on page 24 (credit where it’s due: that headline worked). Food writing captivates when done well, and Malcolm’s measured criticism of the Route 59 venue at Durham’s Marriott Royal County Hotel did just that, with some lovely turns of phrase. After ripping the proverbial out of the “beancounters” who came up with the crazy idea of opening a Tex-Mex barbecue joint in a traditional English hotel, he went on to hilariously describe his horror at what arrived on his plate. “The hog skin was half a dozen or so long strips of rock-like pork crackling with a pot of apple sauce. They might have been good but I couldn’t eat them. Good old Malcolm – and the same salutation to other content providers at the Durham Times. But someone, please, tell Newsquest that its central subbing hub needs more resource, training or probably both. Fact file: the Durham Times’ costs 60p where sold, and on 17 July was a 44-page paper carrying around 150 reads. 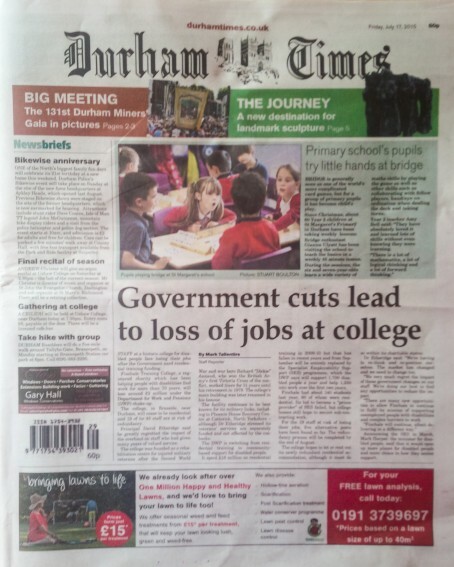 It no longer seems to have an ABC certificate, but Newsquest’s says 52pc of 5,300 copies are paid-for and that it “reaches more adults in Durham city than any other paid for publication”. Spot on Steve. Quality journalism let down by always bland, often inaccurate and sometimes nonsensical headlines thrown on by the Newport subbing factory. Sort it out Newsquest. Postscript: I’ve been told that the Miners’ Gala is traditionally known in Durham as “The Big Meeting”, so my criticism of those particular boost words was misfounded. I agree that stories highlighted have been badly let down by people who obviously have no real connection to the area, little apparent flair for picking the bones out of a story and making it look interesting, and probably far too little time to do a decent job anyway. At a time when local papers are under so much stress they have to be much better than this to stand a chance. Sort it out! The next headline I read after this story – DUCK SHOT IN WEST CUMBRIA. From the News and Star online. After yesterday’s national news that Police may no longer be investigating burglaries it’s good to know that in West Cumbria they are still on the ball even if the subs aren’t. Btw the duck died! I’m told that the Durham Times, launched by Newsquest quite recently and certainly during the last ten years, has never held ABC certification. To be fair to the publisher, they invested in launching a newspaper here and they’ve made it stick. Not an easy task as many have discovered. Surely we should be differentiating the products, not replicating? Online and print headlines should be bespoke, performing a different role for different user needs. I’d also suggest the story should have already been online but let’s not rock the boat too much! Point taken, Phil Deane, but the quality here leaves much to be desired – it’s downright poor. There’s even more chance of it sticking with better presentation. surely a workie did the heading. or possibly an ex templater who likes to be known as a journo? Heavens it is a DULL front by any standards. Subs with no connection to the area + too many newspapers to get out + too few people with which to do the job = disaster. As we told management it would do. Quality drops, circulation drops, revenue drops (because the industry doesn’t know how to monetise the internet. Glad I’m out of it. House style: no place names in headlines. >their pictures either so tiny (the miners’ event) or so dark (the sculpture) that they were pretty useless. Nothing to do with Newport. >And the ‘News briefs’ down the left-hand column would have been fine as informative nibs for inside news or entertainments pages, but what on earth were forthcoming bike fun days, organ recitals, college dances and local hikes doing on page one? Again, nothing to do with Newport. Whatever you think of the headlines, Steve, it would be nice if you found out how the system works before blaming the wrong people. Subs are now copy editors: edit the copy, write the headlines. Is all. Sorry, ‘to clarify’ but I think your ‘defence’ has made the subhub sound even worse that Dyson’s blog! You say: “House style: no place names in headlines.” That should be challenged. What about SEO? How many newspapers can afford headline writers for print and differently for web? Fill those headlines with proper nouns! They’re also more interesting than ‘government’ type general nouns. You say: “Their pictures either so tiny (the miners’ event) or so dark (the sculpture) that they were pretty useless.” Well I’m sorry, ‘to clarify’, but as subs you should be throwing those pictures back and saying “not good enough”, or resizing them, zooming, picture-editing. What’s the point of a sub-hub if it can’t/won’t do that? “Nothing to do with Newport” is a weak defence. If those page one nibs were naff, say so! The fault, of course, is Newsquest’s for not properly empowering the hub, and not offering the training, experience or leadership (all three) to make it improve the titles it serves. You say: “Subs are now copy editors: edit the copy, write the headlines. Is all.” That’s just not good enough. A good sub’s job was always to challenge and improve, not acquiesce. >How many newspapers can afford headline writers for print and differently for web? You want Newsquest to get rid of even more staff? You really have no idea of the structure here. It’s now entirely up to the editors to proof the pages before putting them through to output. They sometimes change headlines, no reason they can’t change the pictures. After all, they are the ones who have access to them. >or resizing them, zooming, picture-editing. What’s the point of a sub-hub if it can’t/won’t do that? You’ll have to ask Newsquest. But even the senior subs here don’t have Photoshop. And only a handful have access to pages to alter anything. All most subs have access to is headlines, body copy, and captions. And yes, subs will raise issues with pictures. They can’t fix them, though. >If those page one nibs were naff, say so! Copy is allocated to pages by ‘content managers’. Either the editor or the news editor. Do you think (to quote another contributor) ‘subs with no connection to the area’ should be ringing editors and questioning their news values? Amazingly enough, we’re a hardworking bunch who care about what we do. But what all bar a very few subs do now has been restricted, by this system, to editing copy/captions and writing headlines. It’s why, in fact, the job title now isn’t ‘sub,’ but ‘copy editor’. This system throws the responsibility for everything else firmly into the hands of ‘content managers’ in the various centres around the country. Who, after all, have the local knowledge we are criticised for lacking. We don’t mind criticism when it is at least fairly directed. My ‘not Newport’ points related to the fact Steve Dyson is blaming us (again) without bothering to check who is responsible for what. It’s not a one-off. Every day the paper is littered with problems. It all helps to accelerate the downward trend. I think ‘To clarify’ makes some fair points. But whoever’s to blame, his/her points highlight that Newsquest needs to make some changes to improve this situation. Quality is suffering in a subbing hub. Who knew? yes, I know to should be too, fingers have gone. Unfortunately, being at a Newsquest paper that is also undergoing these changes I can say that it is not an isolated case. News editors have now been put in charge of doing much of what the subs used to do before they were laid off and therefore doing two or three jobs at the same time. All of this is leading to them tearing their hair out in frustration at the new, glitchy system, and the long, tiring hours of dealing with the sheer volume of everything is sometimes leading to a “get it done” attitude rather than aiming for the best quality available. That said, there have also been instances of frankly bizarre headlines coming back from the subbing hub which should be nowhere near a newspaper, which I’m sure is purely down to the lack of experience of some of the people working there who don’t have any experience in newspapers. All in all the current situation is sadly leading to an ongoing diminution of quality that is really not the fault of anyone directly putting the paper together. I would have thought “house style: no place names in headlines” (or intros for that matter) was pretty general and for a very good reason. What on earth does SEO have to do with print? The two types of headlines perform different tasks and should be done differently! Even if the same person has to do both, it’s not THAT much more work! And yes, I do do both….